Kate, the daughter of a wealthy businessman named E.A. Lomax, is abducted by a Chinese warlord named Li Deng near Chengdu, where she was volunteering as a nurse. Lomax recruits the former World War I fighter pilot Jake “Lucky” Masters for a dangerous mission: travel to Hong-Kong, locate a mysterious ninja, and find a way to infiltrate Li Deng’s fortress and rescue Kate. 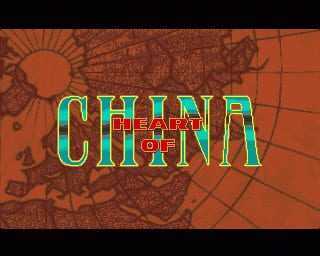 Heart of China is an adventure game with a romantic theme somewhat reminiscent of films such as Raiders of the Lost Ark. The game is set during the 1930’s in China as well as a few other locations. 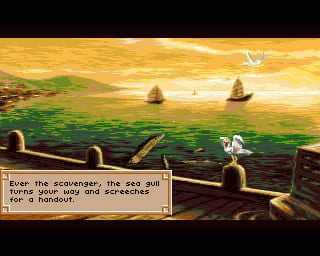 It uses a simple point-and-click system for interaction and object manipulation, and is very similar visually and gameplay-wise to Rise of the Dragon. Some of the tasks in the game have multiple solutions, allowing the player to pursue different methods and choose different responses in branching dialogues. However, some choices may lead to the protagonist’s death or bring the investigation to a dead end. There are also a few arcade sequences, which can be skipped if the player fails to complete them after several tries. The game utilizes digitized photos of live actors superimposed on hand-painted graphics. From the breathtaking splendor of 1930 Asia, three strangers are about to set forsth on and adventure that will span an entire continent. She is daughter of a ruthless American land baron, facing death somewhere in the lush mountains of central China. Together they will travel the crowded streets of Hong Kong, cross the blinding snowfields of the Himalayas and ride the fabled Orient Express… all on a journey of life, love and death that could only begin in the Heart of China. A powerful yet easy-to-use point and click interface allows you to explore, communicate and interact without typing. Copyright © 2014 - 2019 SocksCap64, All Rights Reserved. Logos, Trademarks, Pictures Belongs To Their Respected Owners. Powered By WordPress. 97 Queries in 0.541 seconds.